Major-General Sir Thomas Makdougall Brisbane, 1st Baronet GCH, GCB, FRS, FRSE (23 July 1773 – 27 January 1860) was a British soldier, colonial Governor and astronomer. Brisbane was born at Brisbane House in Noddsdale, near Largs in Ayrshire, Scotland, the son of Sir Thomas Brisbane and Dame Eleanora Brisbane. He was educated in astronomy and mathematics at the University of Edinburgh. He joined the British Army the 38th Foot, Staffordshire Regiment in 1789 and had a distinguished career in Flanders, the West Indies, Spain and North America. He served under the Duke of Wellington, and in 1813 he was promoted to Major-General. He saw much action during the Peninsular War, including leading a brigade in the 3rd Division that broke through at Battle of Vitoria. He continued as a brigade leader in the War of 1812, where in 1814 he led a brigade at the Battle of Plattsburgh, which Brisbane claimed they could have won if they had been allowed to launch a full infantry attack. During the battle, he used the Charles C. Platt Homestead as his headquarters. For his services in the Peninsula, Brisbane received the Army Gold Cross with one clasp for the battles of Vitoria, the Pyrenees, Nivelle, Orthez, and Toulouse; and the silver war medal with one clasp for the Nive. In November 1819 he married Anna Maria Makdougall. In 1821, on the recommendation of Wellington, Brisbane was appointed Governor of New South Wales, a post he held until 1825. While Governor he tackled the many problems of a rapidly growing and expanding colony. He worked to improve the land grants system and to reform the currency. He set up the first agricultural training college in New South Wales and was the first patron of the New South Wales Agricultural Society. He conducted experiments in growing tobacco, cotton, coffee and New Zealand flax in the colony. Brisbane took over the government on 1 December 1821, and at once proceeded to carry out some of the reforms recommended in the report of John Thomas Bigge. 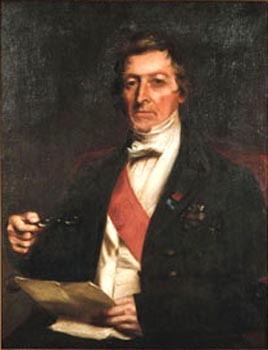 Brisbane did not always receive loyal support from his administrative officers, and in particular from Frederick Goulburn, the colonial secretary. A reference to Brisbane's dispatch to Earl Bathurst dated 14 May 1825 shows that Bigge's recommendations had been carefully considered, and that many improvements had been made. Brisbane did not limit his attention to Bigge's report. Early in April 1822 he discovered with some surprise the ease with which grants of land had hitherto been obtained. He immediately introduced a new system under which every grant had the stipulation that for every 100 acres (400,000 m2) granted the grantee would maintain free of expense to the crown one convict labourer. He also encouraged agriculture on government land, streamlined granting of tickets of leave and pardons and introduced, in 1823, a system of calling for supplies by tender. When Dr. Robert Wardell and William Wentworth brought out their paper the Australian in 1824, Brisbane tried the experiment of allowing full latitude of the freedom of the press. In 1823 Brisbane sent Lieutenant John Oxley to find a new site for convicts who were repeat offenders. Oxley discovered a large river flowing into Moreton Bay. A year later, the first convicts arrived at Moreton Bay. Brisbane visited the settlement in 1826. Oxley suggested that both the river and the settlement be named after Brisbane. The convict settlement was declared a town in 1834 and opened to free settlement in 1839. He was the first patron of science in Australia, and as such was eulogized by Sir John Herschel when he presented Brisbane with the gold medal of the Royal Astronomical Society in 1828. Oxford and Cambridge gave him the honorary degree of DCL, and he was elected a fellow of the Royal Societies of both London and Edinburgh. He was created KCB in 1814 and GCB in 1837. When Brisbane returned to Scotland he continued his studies and built a further observatory on his wife's estate, Makerstoun, near Kelso in the Borders. He was a member of the Royal Society of Edinburgh and received their Keith Prize in 1848. He was elected president in 1833 after the death of Sir Walter Scott, and in the following year acted as president of the British Association for the Advancement of Science. He founded a gold medal for the encouragement of scientific research to be awarded by the Royal Society of Edinburgh. Brisbane died much respected and honoured on 27 January 1860 in Largs. His four children predeceased him. He is buried in the Brisbane Vault, which is in the small kirkyard next to Skelmorlie Aisle, Largs Old Kirk. Wikisource has the text of the 1911 Encyclopædia Britannica article Brisbane, Sir Thomas Makdougall. The Sir Thomas Brisbane Planetarium (in Brisbane, Australia). The crater Brisbane on the Moon. The Canberra suburb of Isabella Plains is named after Sir Thomas's daughter Isabella Brisbane. ^ C.D. DeRoche and Russell Bordeau (September 1978). "National Register of Historic Places Registration: Charles C. Platt Homestead". New York State Office of Parks, Recreation and Historic Preservation. http://www.oprhp.state.ny.us/hpimaging/hp_view.asp?GroupView=1272. Retrieved 2010-06-24. ^ "Brisbane Glen, Largs". Ayrshire Birding. http://www.ayrshire-birding.org.uk/locations/brisbane.htm. Retrieved 2009-11-02. J. D. Heydon, 'Brisbane, Sir Thomas Makdougall (1773 - 1860)', Australian Dictionary of Biography, Volume 1, MUP, 1966, pp 151–155. Serle, Percival (1949). "Brisbane, Sir Thomas Makdougall". Dictionary of Australian Biography. Sydney: Angus and Robertson. http://gutenberg.net.au/dictbiog/0-dict-biogBr-By.html#brisbane1. This page uses content from the English language Wikipedia. The original content was at Thomas Brisbane. The list of authors can be seen in the page history. As with this Familypedia wiki, the content of Wikipedia is available under the Creative Commons License.